I’m getting a crick in my neck. 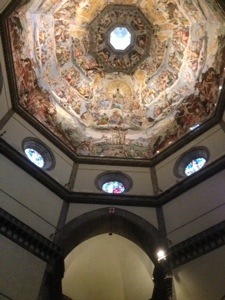 In Italy, if you don’t look up, you’re missing out. 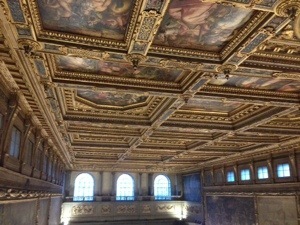 Most of the palazzos and museums we’ve been in to have ceilings that look like this. 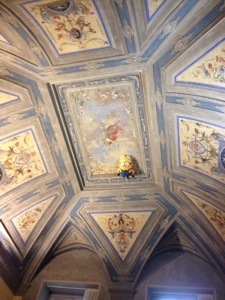 We went to the Uffizi today, and you can’t take photos, but there was even modern art going on in the ceiling of the place you left your backpacks. 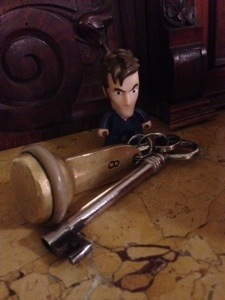 I should mention our accommodation in Firenze. You know how they have a ton of left over castles and palaces which they fill with their leftover art and armour collections? Well they also have left over more minor buildings that they rent out to travellers on a budget. I’m sitting on the stairs of a working convent which still has enough nuns to bust me sitting on the stairs typing a blog. Why can’t I sit on a chair? Well, next time one goes past I shall have assembled a sentence to advise them that I like sitting on the stairs and I already have piles. They don’t have enough nuns to fill up the place, so here we are. We’ve cracked the record for the biggest room keys so far. 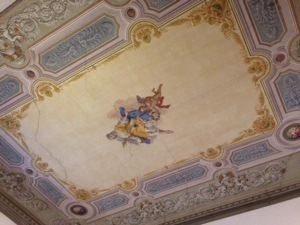 And check out our ceiling! Our actual bedroom ceiling. I don’t give a hoot that the bathroom is down the corridor and you can’t stand up in it for a handheld shower because it’s under the stairs. It’s too awesome for words. I want a history of this place! In Firenze we’re hitting the heights. There were three sets of stairs we wanted to conquer, and we’ve done them all. 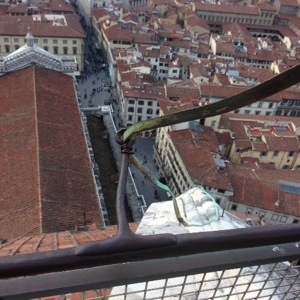 Yesterday we went up the tower of the Palazzo Vecchio. 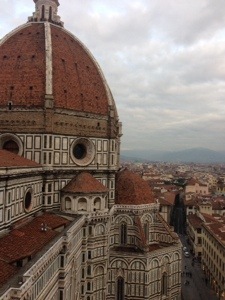 From there you can see the two other vantage points we wanted, the Duomo and the bell tower of the Duomo. 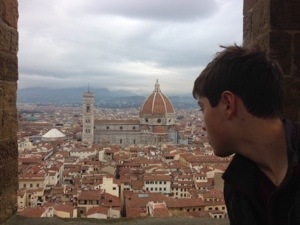 We did the more challenging Duomo first. That was amazing. Here’s the dome from the ground. 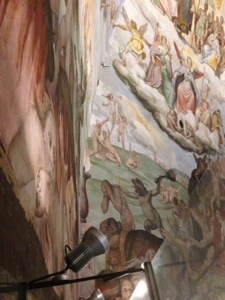 On the long climb up you first pop up inside the dome, where you can get a close up view of heaven and hell painted on the huge dome. I think you’ll agree that it’s a pretty terrifying prospect to spend eternity being beaten with a club by a half man half dolphin. What’s even more terrifying is getting out on to the top of the dome itself. I’ll show you how it looks from the adjacent bell tower. See the top of the dome? See those tiny ant like figures? See that entirely inadequate sketch of a guardrail? That was us up there. I wonder how many tourists they lose over the side every week? Here’s a shot of the ground, taken with an outstretched arm, I couldn’t go near the edge. I felt like the smooth slippery marble floor sloped down towards the edge. I spent my time up there pressed up against the wall, and I wasn’t the only one. And you wouldn’t be getting any of your economy sized American tourists up those tiny spiralling stairs either, for a start they’d have a heart attack, then after that they’d get wedged in and you’d need a vat of olive oil to get them out again. Might explain why I didn’t see any. After that the bell tower was a doddle, with a lovely strong cage over the viewing area. However, my knees feel like loosely attached castanets, making strange clunking sounds as I wearily ascend the forty stairs that will take me to the first floor of the convent. They loved a bit of scale in the olden days. Oh well, not much walking planned for tomorrow. Planned being the operative word here. 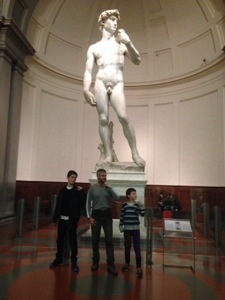 Don’t worry, we saw David. So we’ve ticked off the important things, anything we do tomorrow will be jam. That is, if my knees can get me down to breakfast. I think me and Cheryle stayed in that convent!